All done just awaiting the arrival of the semi-gloss varnish. Probably end of the week. Sounds good ! Looking forward to seeing this one, and the next ! 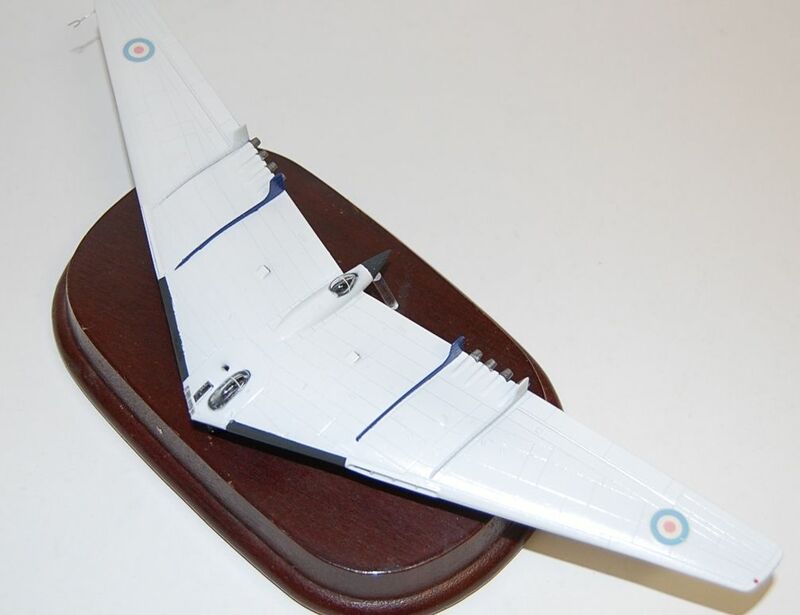 The fourth of Britain’s V Bombers and the second of her “flying wings” the Vengeance was the only R.A.F. bomber designed from the onset as a delivery system for the nuclear bomb, indeed she was unable to carry a large conventional load of any kind. Even now she is shrouded in secrecy and indeed mystery, although over the last few years some information has come into the public domain of the two early bomber versions in particular. The two strategic reconnaissance versions are a different kettle of fish however and enquiries are still met with polite but very firm “no comments”. Push the subject farther and you will probably get a knock on the door and a polite request to desist. Indeed it is rumoured that the S.R.4 is still in service, and that is all I will say on the matter. Anyway this is one of the early B.1’s which had their first official flight in early 1952, although there were rumors of a strange shape being seen in the skies over the Irish Sea earlier than that. 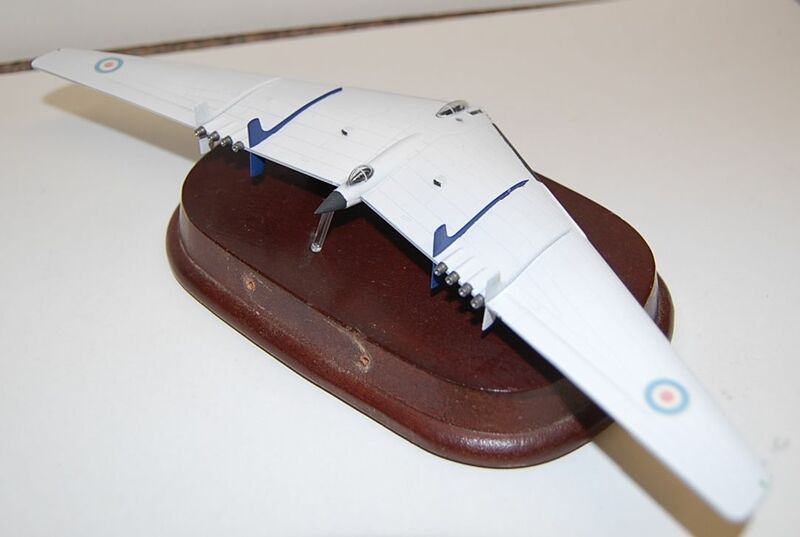 As was only to be expected with such an advanced design it took quite a while for the aircraft to enter service and she eventually did so with 7 Squadron in 1958. The B.1 only ever served with 7 Squadron and was quickly joined in service by the B.2 which went on to serve with 90, 138 and 199 Squadrons. The B.2 was a huge improvement over the B.1 and can easily be identified by the fact that it only needed 6 of the more powerful R.R. engines, compared to the B.1’s 8 Bristol’s. The story then becomes rather murky. It is known that on retirement “most” of the B.2’s were converted to S.R. 3’s, although some may have been B.2 (SR) and then we come onto the S,R,4. Were they converted from older airframes, or were they new builds ? Given that one of the only hard facts known about this aircraft is that they only needed 4 of the newer engines this author is of the opinion they were new builds, but don’t hold me to that. So here we have a B.1 Vengeance modeled as she appeared at one of her very, very few public appearances during Farnborough 1960, which accounts for the blue painted inner tail fins/rudders. Other than this and one other recorded public flight at the Queens Silver Jubilee the most that has been seen is contrails high in the sky. 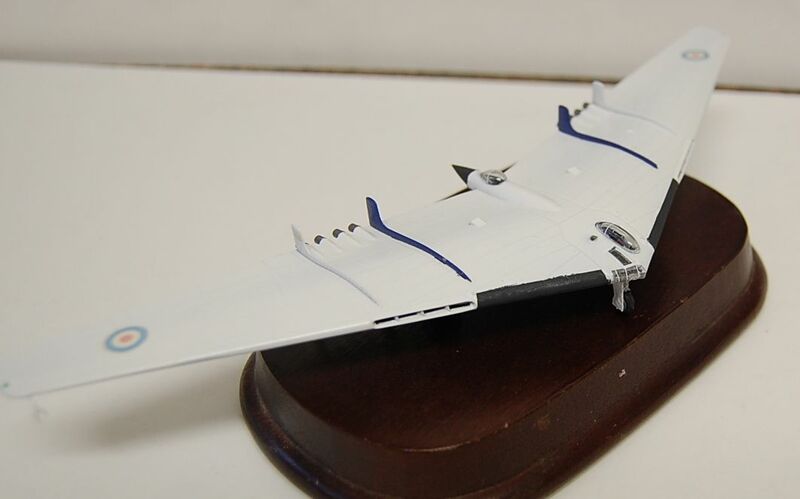 The model is the Cyber-Hobby kit and despite its small scale it is an absolute delight to build, indeed I have a second to convert to the S.R.4. Paint was straight from a Halfords spray can of white primer covered in Humbrol satin varnish. The blue is Humbrol acrylic, whilst the very few transfers are from a Flightdec 1/144 sheet for the national markings and the serials are from an old 1/72 kit with the numbers reversed to get an unused (I hope) serial. So a nice easy build which I thorough enjoyed and that’s the whole point, isn’t it ? As for the second R.A.F. flying wing ? Well that was the much more recognizable AW. Auckland which graced air shows the world over through the second half of the 20th Century and which I’m currently in the process of building. I like it, I LIKE it, I LIKE IT! Super idea and a super looking aeroplane. That colour scheme is the sort of thing they'd have done at Farnborough in the 60s too, viz. the Blue Diamonds. 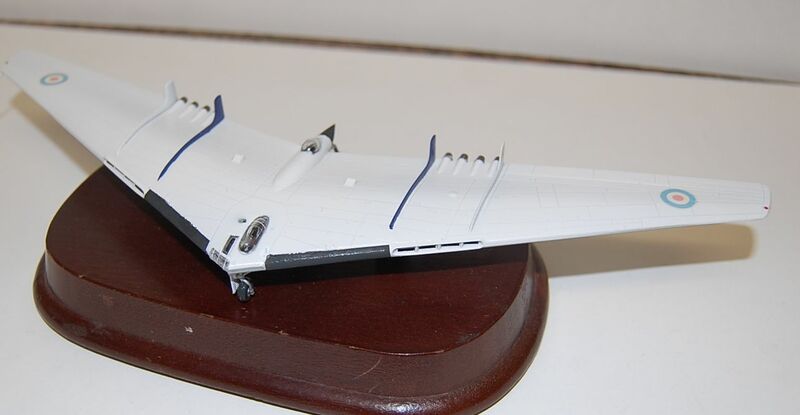 I'm tempted to track down a YB-49 in 1/72 and do something similar to match my Northrop Northampton B(PR)1. That looks very good! I like both the model and the story, great job! excellent looking model, and I hadn't realised how "small" until the last pic of it in hand. Growing older is inevitable, growing up isn't! Are losing theirs and blaming it on you....."
That turned out great ! Love the colours and markings on her. I'm really surprised by the pic of you holding it, it's tiny ! Great job.